One of the grandest and most lavish movies ever created, Amadeus is a riveting story of artistic intrigue set in the suddenly captivating world of classical music. 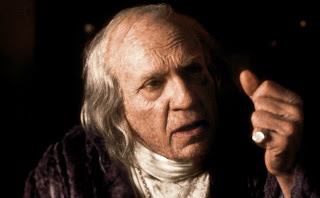 The movie is told in flashback, with an old Antonio Salieri (F. Murray Abrham) in a mental hospital recounting his tale to a visiting priest. Salieri was the resident court composer for Emperor Joseph II (Jeffrey Jones) in the thriving Vienna of the late 1700s. Competent but relatively uninspired, Salieri was living his dream of being the most respected composer in the land until a young and playful Wolfgang Amadeus Mozart arrived from Salzburg and caused a storm in the music world. Salieri is torn between absolute admiration for Mozart's sheer brilliance and abject despair at the gulf in talent between them. Salieri perceives Mozart as God's instrument to personally mock him, and turning away from religion he commits to destroying the young composer's career and life. Mozart marries Constanze (Elizabeth Berridge) and despite producing magnificent music struggles to make a living, with Salieri using his considerable influence to block every opportunity that Mozart has for success. Mozart also suffers through a difficult relationship with his demanding father Leopold (Roy Dotrice). In poor health and descending into grovelling poverty, Mozart is susceptible to Salieri's growing evil intentions. The story is of course far-fetched legend, with no historian actually believing that Salieri was anything other than a contemporary rival of Mozart. Fiction Amadeus may be, but director Milos Forman adapts the Peter Shaffer play with sumptuous grandeur, recreating 18th century Vienna as a cradle of music and the arts. With a soundtrack filled with standout Mozart selections, every scene and setting is a feast for the eyes and ears, from the royal palace to the majestic performing theatres, and even Mozart's relatively humble apartment is posh. Many scenes were filmed in Prague, notably at the restored Count Nostitz Theatre where Mozart's actual operas launched. F. Murray Abraham delivers a performance of immense intensity as Antonio Salieri, a man who believes that God is toying with him by demonstrating his failings through Mozart's effortless genius. As the old Salieri in the hospital recounting his story, Abraham dances on the edge of insanity as he finds his mediocrity ultimately amusing. In the flashbacks Salieri is the king of his music domain, having to react to a sudden threat from an unlikely source. Abraham allows the manipulative scheming to register above his ears, smiling as he hatches a plot to counter pure talent with concealed evil. 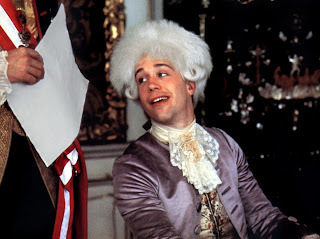 Tom Hulce brings Mozart to life as a man-child, fully aware of his prodigious talent but unable to make the leap into adult behaviour. With a high-pitched childish laugh, Hulce's Mozart is hyperactive, presumptuous and insolent, and like many geniuses unable to comprehend the limitations of mere mortals. Elizabeth Berridge, a very late replacement for Meg Tilly as Constanze, struggles somewhat to rise to her surroundings, but enjoys a few appealing coquettish moments when she pauses from her incessant demands for Mozart to make more money. Amadeus is ultimately about the power of music, and Forman on several occasions touches sublime heights in describing the spell of perfect compositions, with Abraham entering infectious trance-like states in describing Salieri's overwhelming awe at experiencing Mozart's compositions. Another scene captures the agony and ecstasy of the creative process, Mozart and Salieri collaborating to write music, Mozart a fountain of stunningly original ideas, Salieri desperately capturing them before they slip away. Amadeus deservedly dominated the Academy Awards, winning in eight categories including Best Film, Best Actor (Abraham) and Best Director. Much like the music of Mozart, Amadeus effortlessly entertains, educates, and mesmerises with a flawless artistic touch of magic.